AMONGST the migratory birds that pass the winter in this country is the short-eared owl, Stryx brachyotus: it arrives in October, sometimes in flights of some number. I have heard from perfectly good authority of sixteen or seventeen of these birds having been found in one turnip-field on the east coast, evidently having just arrived. It is a long-winged bird, and more active in its manner of flight than most of the other owls, nor is it so completely nocturnal. I saw one of This kind hunting a rushy field and regularly beating it for prey at midday. The owl was so intent on his pursuit that he flew straight in my direction and nearly close to me before he observed me. When he did so, he darted off with great quickness and with a most hawk-like flight, but too late to escape. I killed him (though it is against my usual rule to shoot at an owl), because he appeared to me to be of a different species from any with which I was acquainted. Before I shot him he had put up and made a dash at a snipe, but did not follow up his pursuit, probably perceiving that it would be useless. I have very frequently flushed this kind of owl in rushes, furze, and other low cover. When put up, instead of being distressed and confused by the light of the sun, he flies boldly and steadily away. Sometimes I have seen one, when put up, rise high in the air and fly straight away until I could no longer distinguish him. The owls that breed here are the long-eared owl, the tawny owl, and the barn-owl : the latter, though so common in England, is by far the rarest in this country. The long-eared owl is a fine bold bird, and his bright yellow eye gives him a peculiarly handsome appearance : altogether he is of a lighter make and more active than the other owls; they are very common in the shady fir-woods. I often see this bird sitting on a branch close to the stem of the tree, and depending on the exact similitude of his colour to that of the bark, he sits motionless with his bright golden eye watching earnestly every movement I make. If he fancies himself observed, and likely to be molested, down he dashes, flies a hundred yards or so, and then suddenly pitches again. His long ears and bright eyes give him a most unbirdlike appearance as he sits watching one. As soon as evening comes on, the owl issues forth in full life and activity, and in the woods here may be seen and heard in all directions, sitting on the topmost branch of some leafless tree, generally a larch or ash (these two being his favourites), where he hoots incessantly for an hour together, swelling his throat out, and making the eccentric motions of a pouter pigeon. They breed in rocks, ivy, or in the deserted nest of a magpie. I do not know why, but I never could succeed in rearing one of these birds—they have invariably died, without any apparent cause, before their first year was over. Not so with the tawny owl. One of these birds has been in my kitchen-garden for three years. Though his wing is sometimes cut, he can fly sufficiently to get over the wall, but seldom ventures beyond the adjoining flower-garden or orchard. From habit or tameness this bird seems to pay little regard to sunshine or shade, sitting during the daytime as indifferently in the most open and exposed places as in the more shaded corners : he is quite tame, too, and answers to the call of the children. He hoots as vigorously at midday as at night, and will take a bird from my hand when offered to him. Although his flight has been impeded by his wing being cut, he seems to have entirely cleared the garden of mice, with which it was much overrun. Though a light bird, and not apparently very strongly built, his sharp claws and bill enable him to tear to pieces any crow or sea-gull that is offered to him. When he has had his meal off some large bird of this kind, and has satisfied his appetite, he carries away and carefully hides the remainder, returning to it when again hungry. I do not know whether the owl, when at liberty in his native woods, has the same fox-like propensity to hide what he cannot eat. I have frequently heard this kind of owl hoot and utter another sharp kind of cry during the daytime in the shady solitudes of the pine-woods. The white or barn-owl is rare here, and very seldom seen. I believe him to have been almost eradicated by traps and keepers. With regard to the mischief done by owls, all the harm they do is amply repaid by their utility in destroying a much more serious nuisance in the shape not only of the different kinds of mice, but of rats also, these animals being their principal food, and the prey which they are most adapted for catching. I knew an instance where the owls having been nearly destroyed by the numerous pole-traps placed about the fields for the destruction of them and the hawks, the rats and mice increased to such an extent on the disappearance of these their worst enemies, and committed such havoc among the nursery-gardens, farm-buildings, etc., that the proprietor was obliged to have all the pole-traps taken down, and the owls having been allowed to increase again, the rats and mice as quickly diminished in number. When the long-eared owls have young, they are not particular as to what they prey upon, and I have found the remains of many different kinds of game about their nests. 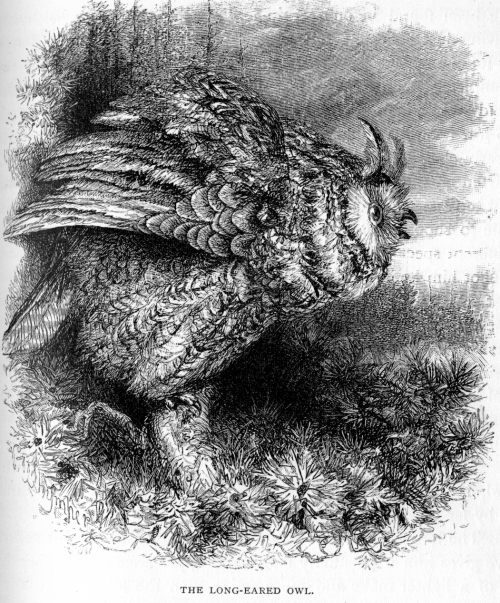 The wings of the owl are peculiarly adapted for seizing their sharp-eared prey with silence: were it otherwise, from not having the rapidity of the hawk and other birds of prey, the owl would have little chance of catching the active little mouse. As it is, he comes silently and surely near the ground, and dropping down on the unfortunate mouse, surrounds it with his wings, and grasping it in his sharp and powerful claws, soon puts an end to the little animal. The wings are fringed with a downy texture, which makes his flight quite inaudible on the calmest night. The numbers of mice destroyed by a breeding pair of owls must be enormous, and the service they perform by so doing very great to the farmer, the planter, and the gardener. Though neither cats nor owls ever eat the little shrew-mouse, they always strike and kill it when opportunity offers, leaving the animal on the spot. What there is so obnoxious to all animals of prey in this little creature it is impossible to say. Besides the shrew, we have the common house-mouse, the short-eared mouse, and that beautiful bright-eyed kind, the long-tailed field-mouse. The last is very destructive to the garden-seeds, and without the assistance of the owls would be kept under with great difficulty. The large-headed short-eared mouse is not so pretty an animal, but equally destructive, taking great delight in sweet peas and other seeds; they also climb the peach-trees and destroy great quantities of the fruit. A fig-tree this year, when its winter covering of straw was taken off, was found to be entirely barked and all the shoots eaten off by these mice. The shrew-mouse has the same propensity for barking trees. I have known the former kind, indeed, destroy Scotch fir-trees of the height of fifteen or sixteen feet by nibbling and peeling the topmost shoot till the tree gradually withered away. The quantities of acorns and other seeds that the long-tailed field-mice hoard up for their winter use show that, were they allowed to increase, the mischief they would do would be incalculable; and undoubtedly the best way of getting rid of all mice is to preserve and encourage owls. The long-tailed field-mouse has great capabilities as a digger, and in making his hole carries up an incredible quantity of earth and gravel in a very short time. When the weather is cold they close up the mouth of their hole with great care. They seem to produce their young not underground, but in a comfortable, well-built nest, formed in the shape of a ball, with a small entrance on one side. As it is built of the same material as the surrounding herbage, and the entrance is closed up, it is not easily seen. Everybody must be glad to encourage any animal that kills a rat, and the owls are the most determined enemies to this, the most disgusting and obnoxious animal which we have in this country. For what can be so sickening as to know that these animals come direct from devouring and revelling in the foulest garbage in the drains of your house, to the larder where your own provisions are kept; and, fresh from their stinking and filthy banquet, run over your meat with their clammy paws, and gnaw at your bread with their foul teeth ? what cleansing and washing can wipe away their traces ? Nothing will keep out these animals when they have once established themselves in a house. They gnaw through stone, lead, or almost anything. They may be extirpated for a time, but you suddenly find yourself invaded by a fresh army. Some old rats, too, acquire such a carnivorous appetite, that fowls and ducks, old or young, pigeons, rabbits,— all fall a prey to them. Adepts in climbing as well as in undermining, they get at everything, dead or alive. They reach game, although hung most carefully in a larder, by climbing the wall, and clinging to beam or rope till they get at it; they then devour and destroy all that can be reached. I have frequently known them in this manner destroy a larder full of game in a single night. They seem to commence with the hind legs of the hares, and to eat downwards, hollowing the animal out as it hangs up, till nothing but the skin is left. In the fields, to which the rats betake themselves in the summer time, not only corn, but game, and eggs of all kinds fall to their share. Mr. Waterton says that no house in England has more suffered from the Hanoverian rats than his own; I don't doubt it—in every sense. The poor water-rat is a comparatively harmless animal, feeding principally upon herbage, not refusing, however, fish, or even toads, when they come in its way. The succulent grasses that grow by the sides of ditches, seem to form its chief food during the summer season. Early in the spring, before these grasses are well grown, the water-rat preys much on toads. I have found little piles of the feet, and remains of several of these animals, near the edge of water frequented by these rats, which they seem to have collected together in certain places, and ,left there. I have known the water-rat do great damage to artificial dams and the heads of ponds, by undermining them, and boring holes in every direction through them, below the water-mark, as well as above it. The water-rat has peculiarly sensitive organs of scent, and it is therefore almost impossible to trap him, as he is sure to discover the taint of the human hand. Cunning as the house-rat is, this kind is much more so. Though the former may be in a measure kept down by constant trapping, it is a troublesome method, and there are sure to be some cunning old patriarchs who will not enter any kind of trap. I believe that the best kind of trap in a house is the common gin, laid open and uncovered in their runs. They then do not seem to suspect any danger, but when the trap is covered they are sure to detect its presence, and, like all wild animals, they are much more cautious in avoiding a concealed danger than an open one. Poison is the best means of getting rid of them, and the manner of applying it is as follows:— For the space of a fortnight feed the rats with good wholesome meal and water in some quiet room or cellar accessible to all these troublesome inmates of your house. At first two or three rats may find it out; these are sure to lead others to the place, till the whole company of freebooters go for their share. As soon as you see that they seem to have collected in numbers in your feeding-room, season your meal with plenty of arsenic, and you may be pretty sure of its being all devoured. Continue 'giving them this till you find no more come, and by that time probably there are none left alive in the house. The only danger is, that some of them may die behind the wainscots of your rooms, in which case you must either open the place and search till you find the dead animal, or you must vacate that room till the dreadful stench is over. 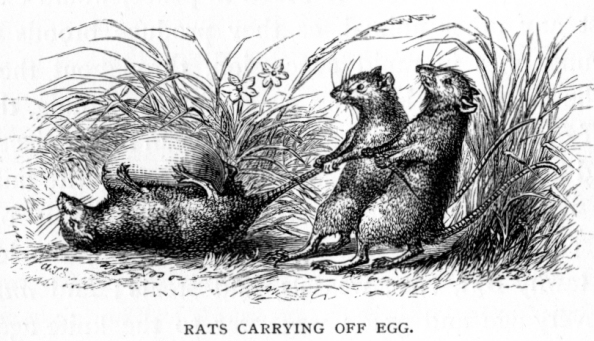 That rats carry off hens' and even turkeys' eggs to some considerable distance is a fact; how they accomplish this feat I should like to know, as they do it without breaking the shell, or leaving any mark upon it. A crow or magpie, Columbus-like, shortens the difficulty by sticking the lower mandible of his bill into a hen's egg when he wants to carry it off, but this is beyond a rat's capabilities; nevertheless, eggs form one of their favourite repasts. The increase of rats, if left to breed in peace, would exceed that of almost any other animal, as they produce broods of six or eight young ones in rapid succession, throughout the greatest part of the year. In building a nest for her young, the female carries off every soft substance which she can find; pieces of lace, cloth, and above all, paper, seem to be her favourite lining. The natural destroyers in this country of this obnoxious animal seem to be, the hen harrier, the falcon, the long-eared and the tawny owl, cats, weasels, and stoats; and ante omnes, boys of every age and grade wage war to the knife against rats, wherever and whenever they can find them. As for rat-catchers—find me an honest one, and I will forfeit my name. I would as soon admit a colony of rats themselves, as one of these gentry to my house,—not but what I have amused myself by learning slight tricks of the trade from one of these representatives of roguery and unblushing effrontery, but fas est et ab hoste doceri. Rats swarm about the small towns in this country where the herrings are cured, living amongst the stones of the harbours and rocks on the shore, and issuing out in great numbers towards nightfall, to feed on the stinking remains of the fish. They have been seen migrating from these places at the end of the fishing-season in compact bodies and in immense numbers. They then spread themselves, an invading host, amongst the farm-houses and stack-yards in the neighbourhood; repairing again to the coast for the benefit of a fish diet and sea air, when their wonderful instinct tells them that the fishing season has again commenced. But I really must finish the subject, or my reader will be as tired as I am myself of these accounts of the unprincipled greediness and voracity of the Hanoverian or Grey Rat, who has made for itself a home in this, country, after nearly extirpating the original indigenous and much less vile race of British rats.